Beautiful classic quilted handbag in calf leather, designed and crafted by Italian artisans at Carbotti. This timeless large shoulder bag is double stitched to give the classic quilted effect. 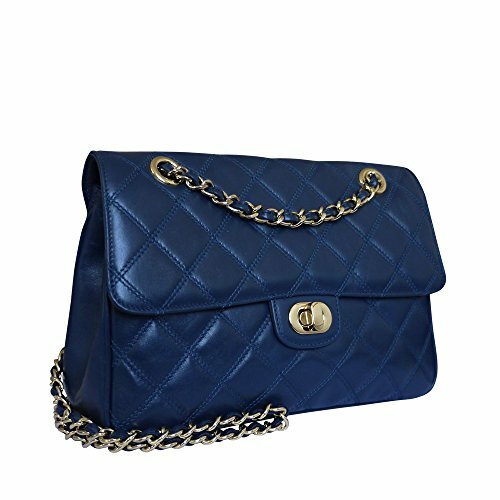 It has a front flap with gold hardware twist lock and a long detailed gold chain that can be doubled to alter where the bag sits at either waist or hip level. The interior has 2 main compartments, is lined in fine jacquard fabric with an interior wall zip pocket and hidden exterior pocket on back. A must for your wardrobe. If you have any questions about this product by Carbotti, contact us by completing and submitting the form below. If you are looking for a specif part number, please include it with your message.